I shaped this hybrid shape for the older, larger shortboard surfer who has a job, responsibilities and doesn’t get to the beach as often as he’d like. 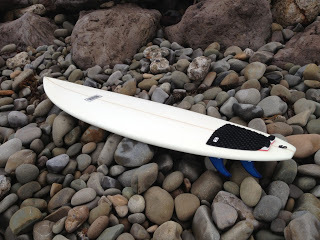 Or, for a surfer who is looking for a sub-7′ board to add to his quiver of mid-size and/or longboard shapes. The board has a full outline with wide-point very close to center, which is typical of hybrid shapes.. The bottom has relaxed entry rocker with a slight kick in the last 6″ to cope with later take-offs. Bottom contours are a subtle single-to-double concave. At 2-5/8″, the thickness is in between standard shortboard thickness and standard funboard thickness, striking a balance between paddling power and lower volume. The five fin-box option allows the rider to experiment with either tri-fin, quad-fin or 5-fin configurations. As a transition board, this shape tries to provide the broadest performance range possible. Dimensions are 13″x20-1/2″x15″ 2-5/8″. Those interested in the shaping of this board can check here. Contact me if you’re interested in taking this board for a spin.